Dell on Thursday started shipping new Inspiron and Vostro laptops powered by Intel's latest Sandy Bridge processors with prices starting at US$499. The company's Vostro 3000-series laptops will come with 13-, 14-, 15- and 17-inch screens, with prices starting at $499. The laptops will be equipped with the newest Core i3, i5 and i7 dual- and quad-core processors based on Intel's latest microarchitecture, code-named Sandy Bridge. Dell also announced Inspiron R-series consumer laptops with Intel's new processors. The laptops will come with screen sizes of 14, 15 and 17 inches. Laptops with the new Sandy Bridge chips are slowly trickling out to replace models with older Intel chips. Sandy Bridge chips are faster and more power-efficient than older chips. 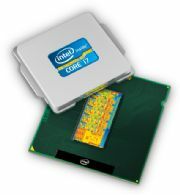 PC makers including Hewlett-Packard and Lenovo have already announced laptops based on new Core i3, i5 and i7 processors. The new chips have provided a longer battery life to Vostro and Inspiron laptops, said Alison Gardner, marketing director of the consumer, small and medium business product group at Dell. The Vostro 3550, which includes a 15-inch screen, provides around 13.5 hours of battery life with a nine-cell battery and 7.5 hours on a six-cell battery, Gardner said. "We're getting into the realm of 'you can leave your AC adapter at home,'" Gardner said. The Inspiron 15R laptop, which includes a 15-inch screen, provides about 13 hours of battery life with a nine-cell battery, Gardner said. Battery life typically varies depending on the type of battery, screen size and laptop configuration. The Vostro laptops are targeted at small and medium businesses, and are available with advanced support packages. The Vostro 3450, which comes with a 14-inch screen, and 3550, which comes with a 15-inch screen, are priced starting at $499. The Vostro 3350 and 3750, which come with 13-inch and 17-inch screens, respectively, are priced at $599 and $549, respectively. The Inspiron 15R laptop is priced starting at $529. The 14R and 17R, which come with 14-inch and 17-inch screens, respectively, are priced starting at $579. The laptops are shipping worldwide, according to a Dell spokeswoman. The laptops will come with Windows 7, but some Vostro models could come with Ubuntu Linux in some regions. The smallest Inspiron 14R laptop weighs around 4.94 pounds (2.24 kilograms). The Vostro 3350 weighs 4.6 pounds with a four-cell battery and optical drive.